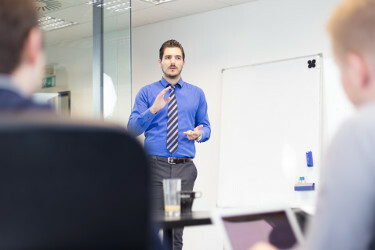 For those seeking immediate help, a one-day Executive Speech Coaching session prepares you for a specific upcoming speech or presentation, whether it’s a press conference, an internal presentation, or a speech to your investors. The process involves self-assessment, videotaped exercises, and direct feedback from two EMS coaches, giving you the chance to see yourself from the listeners’ point of view. By experimenting with a range of options, you’ll be able to build your executive presence and determine which techniques best fit your personal style. 1 Day (or more) of Intensive, Customized Coaching. 2 Coaches Focused on You. Videotaped exercises, loaded on a flash drive for you to take home. Rehearse content delivery, visual aid use, handling questions, and more. If individual coaching isn’t for you, try one of EMS’s group options including customized or public workshops or corporate seminars.